While there might only be anywhere from one to four NBL players who make the final squad for next year’s FIBA World Cup in China, the commitment shown from the 24 players used during the qualifying period has to be admired. It wasn’t without the odd hiccup including a surprise loss to Japan and of the terrible physical assaults hurled upon them in the Philippines. But right throughout it was a Boomers team committed and focused to represent Australia with pride. Most of them will end up making way for the likes of Ben Simmons, Matthew Dellavedova, Aron Baynes, and Joe Ingles, if they are made available for the World Cup. But not once were any of the NBL players representing the Boomers worried about that. 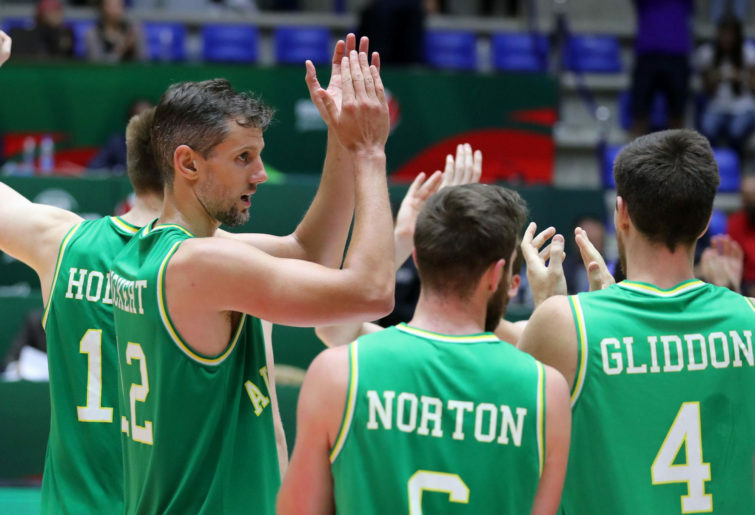 The Boomers proved the dominant team in Asia through the qualifying period and head into that World Cup in September as genuine medal chances. What it does is further highlight how far the NBL has come. The league is now a far smoother running machine, the league is organised enough to build the FIBA windows into the season and the work between Basketball Australia and the NBL has ensured it’s been a well-run process. That leads to greater commitment from the players who come together after being rivals the week before and after on the NBL floor to bond as teammates, and it shows with the way they play. Coach Andrej Lemanis’ system is perfect for international basketball and he has brought in players who thrive in that system – from guards Cam Gliddon, Jason Cadee and Nathan Sobey to bigs like Matt Hodgson, Angus Brandt, Daniel Johnson and then this past weekend Nate Jawai. Lemanis couldn’t be prouder of the commitment shown from every player involved over the qualifying period for the Boomers. “This current qualifying format has exposed a whole bunch of players to the international game of basketball,” Lemanis said. “We’ve had 24 players through and it’s been a fun and rewarding experience for me to watch each one of them grow at different times in this environment, and to see how much it means to them to play in the green and gold and see the reward for what they’ve put in during some of their junior careers and in the NBL. Cadee is one player who has done a tremendous job running the point for the Boomers throughout the campaign and then he broke out for 21 points and five three-pointers in Monday night’s big win over Qatar in Melbourne. He has also joined Lemanis at the Brisbane Bullets this NBL season so he enjoys the way his coach goes about their business, and he has no doubt their bond was formed even stronger after what they all went through in the Philippines. “It helped our whole group because we sat there the next day and looked at each other, and knew that everyone had each other’s back. That will stay with us as long as we’re together, especially with Drej,” Cadee said. For Lemanis, coaching the Boomers continues to give him quite the workload and a juggling act to deal with while still being in charge of a team at the NBL while also leading Australia into an upcoming World Cup and Olympics campaign where medals are hoped for. But what he found when first appointed national coach, and he gave up his role with the New Zealand Breakers, was that he missed that daily grind of coaching his own team. So while it’s added work for him, he wouldn’t have it any other way. “In the first 12 to 18 months there was a lot on for sure but as a coach it’s good to have a lot on because it means you’re employed,” Lemanis said. “But certainly over the last 12 months we’ve settled into a nice little rhythm and BA has been fantastic in providing some support behind the scenes as well to take a lot of the load off my plate, and my assistants take a lot of the load off the plate there. “We’ve got a good little rhythm going in terms of the attention and time to get that right, and the attention and time needed to get the Bullets right. It’s fun to be involved in both and I enjoy it, and it means you’re on the court a lot with players working on things, to get better and with the national team. “When I talk about creating our environment, to be able to recruit good players some of that comes because of trusts and relationships built through that environment. The NBL resumes this Thursday night with a blockbuster between the Sydney Kings and Perth Wildcats with Round 8 extended until Monday night where Melbourne United hosts the Brisbane Bullets.